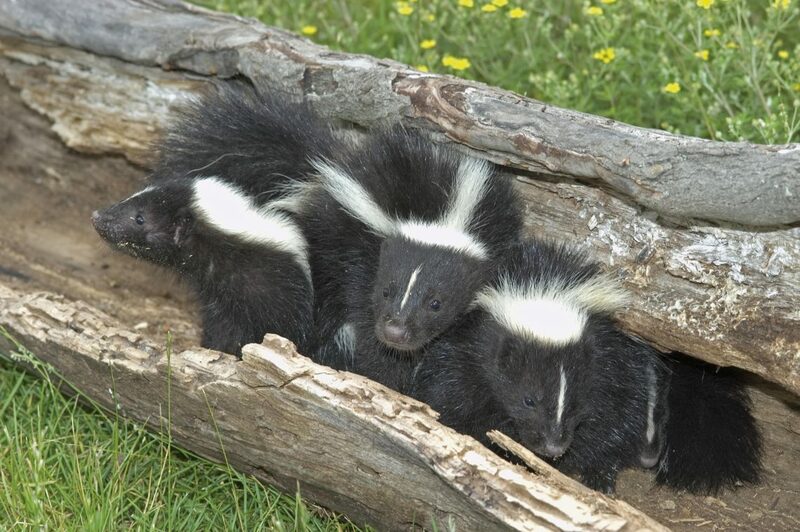 Poor skunks — no one seems to like them, and they are stinky to boot. Unfortunately, they are one of the most common wild animals in San Diego County, and they have been known to pass rabies and other diseases to humans and their pets. Beyond that, they can cause extensive damage to your landscaping and they can decimate your garden crops. Thankfully, Wildlife Removal Services is here to help you maintain a property that is free and clear of these animals. In today’s post, our skunk removal pros will provide a few tips for keeping skunks off of your property, and we will explain what you can do to get rid of skunks that are already on your property. Read on to learn more! Keeping skunks off your property is mostly all about reducing the availability of various food sources and modifying potential habitats. Skunks are similar to other types of wild animals in that they forage for their food. Leaving any type of food out, whether it be pet food in dishes or leftovers in your outdoor trash, can attract skunks to your property. Even worse, if the skunks discover that they can access and eat the food, they are likely to continue coming back for more. Storing pet food indoors, keeping trash cans in your garage, and taking other steps to remove possible sources of food for skunks can help make your property less alluring to them. Skunks forage for food after dark, and aside from pet food and food in your trash, they often love finding fruit and nuts in the yard. That being said, if you have any type of tree that produces fruit or nuts, be sure to pick up those that fall to the ground frequently. Additionally, brush piles, leaves, and other types of debris should be cleared on a regular basis as they can attract insects. Keeping your yard clear of worms and other insects will also limit the food sources that skunks love so much. Skunks are mostly active during the night, which means that they look for safe places to call home during the daytime hours. This can include the space under elevated houses, beneath porches and decks, and inside of storage sheds that are not accessed very frequently. They also like to hide out in barns and chicken coops. If you have any spaces like this on your property, be sure to block them off with fencing, plywood, or another durable material to keep skunks out. While professional skunk removal is the best form of skunk prevention, there are various repellents that property owners can use in an attempt to keep skunks off of their property. Wild animals typically have highly sensitive senses of smell, and many property owners have been able to successfully deter skunks by using pepper spray and placing things like ammonia-soaked rags and citrus peels around their property. Motion-activated lights and sprinklers can also be used, and sometimes even the simple smell of dog urine is enough to repel skunks. Finally, routinely inspecting your property for possible food sources and hiding spots can go a long way in keeping skunks at bay. Although they are known for digging in yards for food and water, skunks actually don’t make their own shelter by digging. Rather, they like to use the abandoned dens of other animals as ready-made hiding spots. If you see any abandoned holes or burrows in your yard, be sure to fill or block them to keep from using them as their homes. Skunk trapping and eviction. We humanely capture the skunk and remove it from your property. Repairs and exclusion treatments. We repair any damage caused by the skunks and block access points to keep them from coming back. Cleanup and disinfecting services. We clean and sanitize the area to ensure that there is no trace of the skunk or its smell. We proudly offer a warranty on all of our work, and we can even offer extended warranties under certain circumstances. Be sure to ask your wildlife removal technician about this incredible benefit! Need Professional Skunk Removal in San Diego County? Removing skunks from your property is not something that should be taken lightly, nor is it an ideal DIY project for homeowners. Wildlife Removal Services offers professional skunk removal in San Diego County that is humane and effective, allowing you to claim victory in the war against these nuisance animals. Give us a call at 619-354-7144 today to learn more or request your free quote online now. We can’t wait to help you!